JJ Designer Market zone shops opened their Le Fue JJ Fash on Fire on June 18, featuring a new designer center in Chiang Mai to be known as Creative Fire. The opening ceremony was presided over by Prinya Panthong, Chiang Mai vice governor and many guests attended. The highlight was a fashion show presenting creative designs and boots. 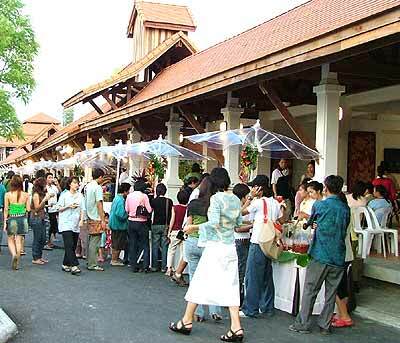 Apiruedee Tontiwetkul, director of JJ Market project said that at the end of the year, their JJ Good Taste Market would open to display Lanna handicrafts, souvenirs and tasty food. JJ Market is located next to Lotus Kamthieng, and open from 11 a.m. until night. Fashion show entitled Le Fue JJ Fash on Fire. Apiruedee Tontiwetkul (2nd from right), director of JJ Market project with Chiang Mai vice governor Prinya Panthong (middle) and shop owners. Activities inside the Le Fue JJ Fash on Fire at JJ Designer Market. All US passport holders and their guests are invited to another year’s 4th of July party at the American Consulate General, 387 Witchayanond Rd. 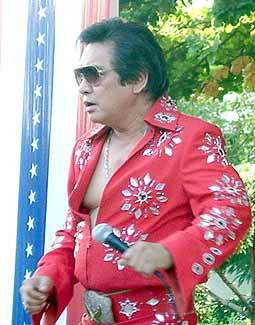 Chiang Mai from 4 p.m. – 8 p.m.
“Elvisky” shows that Elvis Presley is alive and well and through public demand he will make an appearance on Independence Day. This year’s extravaganza will include hot dogs and other American treats, soft drinks and beer from the US and Thailand, patriotic fun and crafts, the Bouncy Castle, prizes and entertainment on the hour — with everything from “Elvis” to the Choral Society, the Dara Band and closing fireworks. The names and IDs of non-American guests must be given to the consulate by email or telephone no later than noon on Friday, July 1. All party-goers need official identification. Come celebrate the 229th birthday of the United States. On behalf of the Tourism Authority of Thailand (TAT), it was the first time that the popular Thailand Travel Mart (TTM) Plus Amazing Gateway to the Greater Mekong Sub-region (GMS) was being co-located with the International Travel Show (ITS) Thailand 2005. This year’s show at the Impact Convention Center in Muang Thong Thani, Bangkok kick-started with a Travel Trade Forum on June 15, followed by two days of business sessions between 543 buyers from 46 countries and 418 sellers and ended with two crowded consumer days on June 18-19. 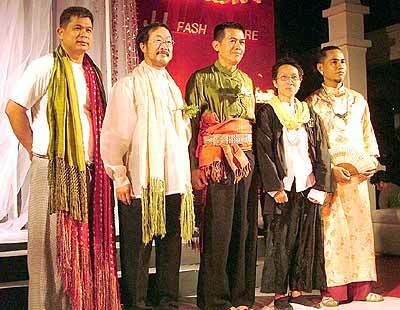 The mood was dampened as Jutamas Siriwan (second from left) was asked to set aside all differences and internal politics and be an active part in getting Thai tourism up and running again by arranging a ‘First Anniversary Ceremony’ for tsunami victims that will remain in the memory of the world and therefore present and future tourists. During the Travel Trade Forum with the topic set as “Thailand: A Model for Sustainable Tourism” it became clear to the attending delegates that Thailand’s recovery process after the horrific tsunami on December 26, 2004 will take much more time than expected. Especially the private sector believes that there will be no essential rebound of tourist arrivals before October 2006. Though TTM Plus was advertised as the biggest ever since it started for the first time in 2001 and was especially important for small and medium-sized enterprises, which do not have large marketing budgets, the mood of the delegates was a depressed one. At the press conference in front of the 95 invited international media representatives on June 15, Juthamas Siriwan, TAT governor, said that the main challenge facing Thailand and the GMS countries, such as China, Myanmar, Laos, Cambodia and Vietnam, is to stay competitive. “We have to work hard to ensure that our products are up to higher standards, deliver value for money and have the underlying infrastructure support, such as the Suvarnabhumi Airport, which will be ready in 2006,” she concluded. The opening ceremony and dinner reception was conducted in style at the Royal Thai Navy Convention Hall in Thonburi, just beside the illuminated Temple of Dawn - Wat Arun, where the new appointed tourism minister HE Somak Thepsutin gave a welcome speech and officially announced the “Happiness on Earth” campaign. TTM Plus has always been a popular platform to promote Thailand and its neighboring countries along the Mekong River. Sub-regional tourism is a key area with strong potential. TTM Plus included incentives by supporting airlines and hotels, pre and post-show tours, special packages and promotional deals that were offered to the international buyers and media. Tourism within the GMS offers a wealth of historical, cultural, and natural attractions, such as Angkor in Cambodia, Luang Prabang in Laos, Sukhothai and Ayutthaya in Thailand, Hue and Hoi An in Vietnam, Dali and Lijiang in Yunnan, Kweilin in Guangxi, and Bagan in Myanmar. However, it is important that air link networks become available, so that Thailand will serve and stay as a main gateway to the Mekong region. The highlight of the networking social functions was without doubt the Travel Trade Gazette (TTG) late night party on June 16 at the Lobby Bar of the new established Holiday Inn Bangkok Hotel on Ploenchit Road, where HiSo and others could mingle freely. Princess Norodom Rattana Devi, secretary of state, ministry of tourism, was a guest of honor and represented the emerging tourism destination of the Kingdom of Cambodia. Living abroad has advantages and disadvantages. One advantage is the expanded horizon for the children who get to grow up in different cultures and environments - a very positive attribute in today’s globalized world. Disadvantages include the farewells which also come on a regular basis, especially at the end of school terms which can be hard on not only the children but also the adults. The best Thai singer from the Royal Thai Air Force gave an extraordinary Goodbye song for Steve Revels who will be moving with his wife and family to Germany. The American community had to say goodbye to four families but made it a ‘fun event’ as every departure is also the start of a new adventure for them. 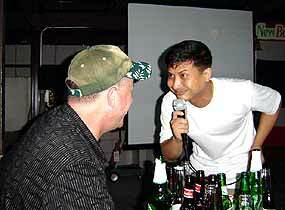 The American compound rocked to “Beat Juice,” composed of various Chiang Mai talents on vocals, guitar, bass and drum. The departing staff members received the “Golden Triangle Award” after CG Bea Camp recognized their contributions in Chiang Mai and wished them well in their next postings. The entertainment included karaoke sessions and some raw talents enfolded. Even Rosa Revels, who will be moving to Germany, gave a last performance of her famous ‘Mexican’ Flamenco dance, highly appreciated by everybody. The winner and runner-up from last year’s “Myanmar Contemporary Art” competition are among the 12 artists exhibiting when La Luna Gallery in Chiang Mai highlights from July 16 to August 14 the lesser known abstract and contemporary art scene in Myanmar (Burma). 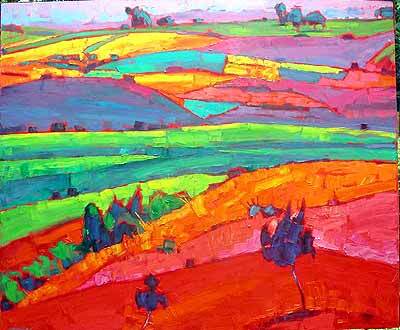 Winning artist Zaw Win Pe uses a palette knife to paint enormous landscapes in untraditional and almost luminous colors whereas the runner-up Nyein Chan Su, known as NCS, uses simple strokes and curves to create landscapes, which are both bold and poetic. The Proud Ladies are presented by Hien Thit, who paints on both canvas and paper to create the beautiful and seductive curves of the female form. More traditional paintings of nuns and monks are also included created by two of Myanmar’s young water-colour artists Myoe Win Aung and Khin Maung Zaw, whereas Ba Khine uses temples, rivers and marketplaces as backdrops from women working or chatting. “Last year we focused on Vietnam in July, this year we will highlight art from Myanmar, another of the five countries from which we display art,” says Sommai Lumdual, the director of La Luna Gallery. “Myanmar art is perhaps most famous for the great masters creating oil paintings of nuns and monks collecting alms and going about their daily tasks, but we want to present some of the lesser known and emerging artists as well,” he said. However, among the dozen artists are also the more established such as Myint Soe and Bogie, re-inventing himself with some brand new “collaints”, his own word to denote a mixture of collages and paintings. For further information, please contact: Sommai Lumdual, 0 9635 7667, La Luna Gallery, 190 Charoenrajd Road, Chiang Mai. Exhibition July 16 – August 14. Open daily from 10 a.m. to 8 p.m. except Monday. Phone 0 5330 6678.